Check out our beginner powerlifting program below and develop strength and power in the big three lifts. 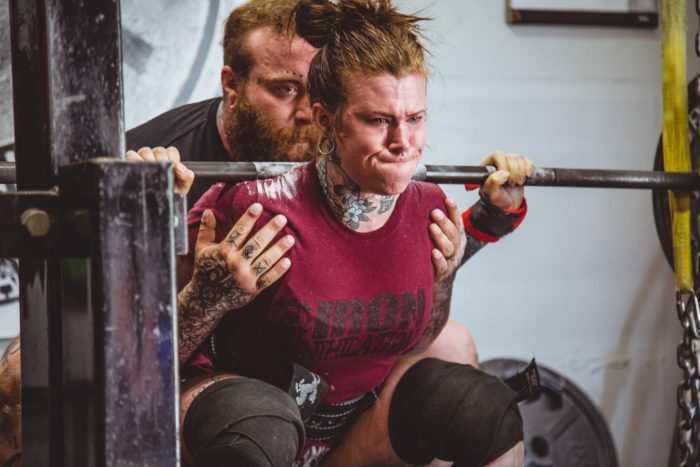 When it comes to powerlifting, knowing where to start isn’t always easy. This sport is all about strength and developing that is about way more than just picking up heavy things. If you’re a complete beginner, chances are you don’t really know what your rep and set pattern should look like. Luckily, we’ve taken the guesswork out of the equation and created a complete beginner powerlifting program for women. We’ve designed our complete program based on the most effective training methods to build strength in the big three lifts: squats, deadlift and bench. Our program is based around the 5×5 ‘Stronglifts’ method, which is widely known as one of the best ways to develop strength for someone who’s new to lifting. 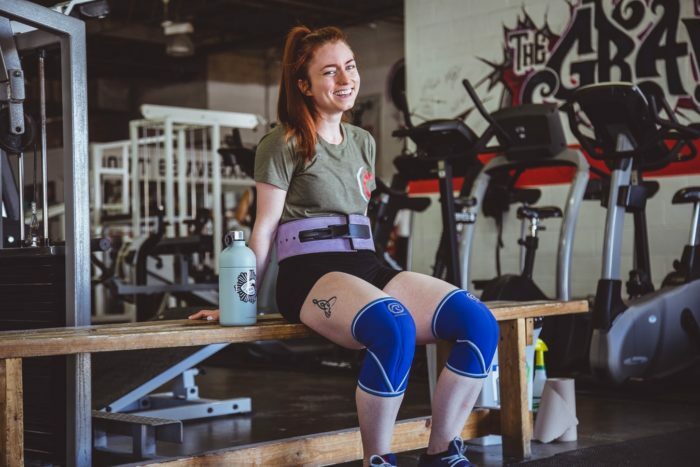 We’ve also worked a few accessories into our beginner powerlifting program to support the big lifts, build a stronger physique and help keep injury at bay. Before you hit the weights room and start this program, there are a few things you need to have nailed down. The most important thing to work on is your technique. If you go into this training program with bad form on your lifts, you’re already limiting how much you can lift, and potentially putting yourself in line for an injury. Speak to a trainer about perfecting your form before you hit the bar. If you’re looking to really push yourself in powerlifting, you’re also going to change the way you normally train. Endurance exercises like running can be detrimental to powerlifting and muscle development. You’ll have to put that kind of training on hold if you do decide to pursue a beginner powerlifting program. It’s very common for this type of training to be focused around your main lifts and just a few accessory movements. We’d also recommend you nail down your nutrition if you want to see the best results from your powerlifting program for beginners. Building muscle is the result of lifting challenging weights and giving your body the fuel it needs to grow. That means eating plenty of calories and protein. Check out our muscle building diet for women article to find out what you should be eating. Our final point before you start is a very important one: remember to challenge yourself. Your body grows muscle and develops strength through a process called progressive overload. This means continually challenging your body by upping your weights regularly. We’ll be asking you to add weight every week on this beginner program, and it’s important you do. Otherwise your body will adapt to one weight and progress will quickly plateau. Follow this beginner program to start building real strength in the big lifts. Begin with a moderate, yet challenging weight then add between 5 and 10 pounds to the weight every week. Also begin at a moderate weight and add 5-10 pounds each week. This should be a fair bit lighter than your back squat and will focus more on the quads to support your back squat. Use a looped resistance band and place around the knees to work the glutes. Up the resistance of the band as it becomes easier with each session. This and the banded clams have been added to activate and strengthen the glutes, which often grow weaker if you spend a lot of time sitting. By doing this you can utilize the muscle more in your squat workouts. As with the banded bridges, put a band around the knees and up the resistance as you progress week on week. Here, work slowly to really challenge the muscle fibers. Push up and lower the weigh slowly for maximum effect. Once again, aim to add 5 pounds with every week. Add between 5 and 10 pounds with each week. Don’t grip the bar too wide and control both the ascent and descent to maximize muscle growth. This changes the focus of the lift to put more strain through your triceps to support your main lift. The nature of this lift isolates your arms, highlighting and working any stabilization weaknesses on either side. You won’t be able to add as much weight to your dumbbell bench as with the bar, but aim to increase it each week. Strong shoulders are essential to a powerful bench press, so it’s important you shore up your deltoids and protect the rotator cuff with your accessory movements. The best way to do this is to use lighter weights and opt for higher rep counts. Once again, begin at a moderate weight, but ensure it’s challenging. Aim to add around 10 pounds every week, you may be able to add slightly more to a deadlift than with a bench or squat. Begin without added load, then pick up a plate if that’s too easy. Up your weight every week where possible. This works a range of upper body back muscles to help support your deadlift. Aim to lift heavy here without compromising form and add weight to the movement every week if you can. Choose a challenging dumbbell and take each movement slowly to build strength in the bicep. Don’t jerk your shoulder and keep your elbow tight to your body as you perform each rep. It’s hard to up the weight with a bicep curl every week, but aim to lift heavier wherever possible. This type of training, especially the deadlift, can leave you with a fair amount of muscle soreness for a few days after each workout. If you don’t know how to deal with the soreness, it can be quite off-putting for a beginner on a powerlifting program. Muscle pain is inevitable, however as you progress through the weeks, your body will come to adapt, and you’ll find it becomes less intense. You might even start to appreciate the pain, as it’s a sign of a rewarding workout. Stretch and roll – Take the time after every workout to stretch and foam roll the areas you’ve worked. This will help to massage the recently damaged tissue, break down knots and soften your muscles. This makes for a quicker recovery, and more efficient muscle repair. Eat plenty of protein – This amino acid is the building blocks of muscle growth and development. By ensuring you’re getting enough protein in your diet, your body will have what it needs to recover more quickly and effectively after a session. Get plenty of sleep – Your body does most of it’s repair work whilst you’re asleep, so it’s essential you get a good 7-8 hours every night. Active recovery – Try not to go and sit on the sofa immediately after you finish a workout. By going for a light walk after you finish a session, you can reduce recovery times by increasing blood flow to your muscles. This helps to flush out painful toxins and even stretches the muscles a little. Drink plenty of water – You’ll no doubt have drank water throughout your workout, but you’ll need to keep it up afterwards. By fully hydrating your body, you’ll be in a better position to flush away any toxins and reduce recovery times. Eat a banana – Working out saps your potassium stores, so by eating a banana, which is high in the nutrient, you will help your body recover and produce muscle energy. 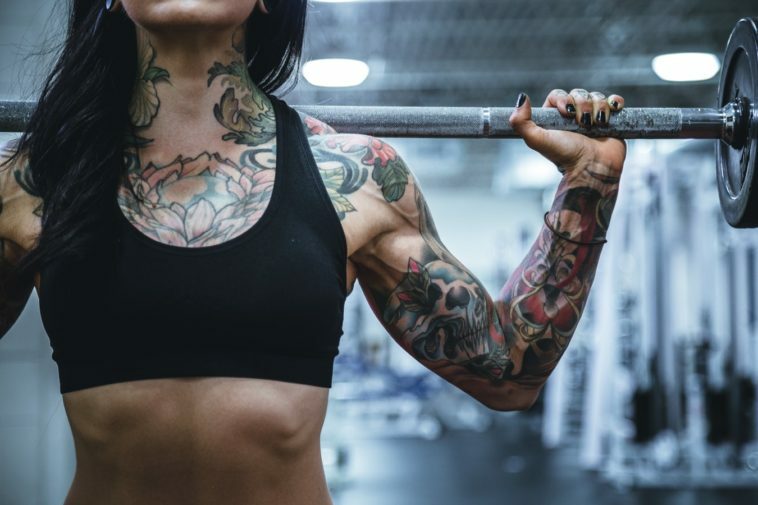 By using these methods, you should be able to reduce the pain and feel fresh enough to hit the gym again for the next workout on your beginner powerlifting program. This program may be simple, but it’s designed to build strength, perfect form and grow power in your main lifts. Its simplicity and effectiveness makes it the ideal beginner powerlifting program for women. As long as you continue to challenge yourself, eat enough protein and commit your self to the program, this beginner powerlifting workout plan will get results.